Hamilton, Bermuda (AP) – First a capsize and then a man overboard. It’s been a dramatic week in the America’s Cup challenger eliminations on Bermuda’s Great Sound, and the main event is still a week away. It wasn’t just any man overboard Saturday. It was a skipper, Nathan Outteridge of Sweden’s Artemis Racing, who fell overboard during a tack in Race 3 of the challenger finals, allowing Emirates Team New Zealand to sail ahead and take a 2-1 lead in the best-of-nine series. 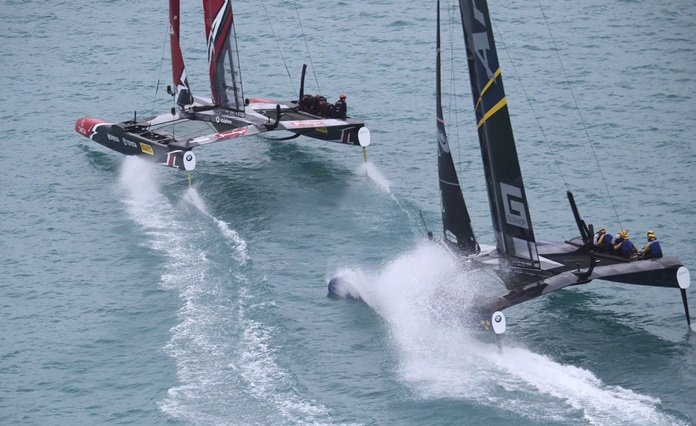 Outteridge slipped and flew off the boat as the six-man crew went through its quick, choreographed sprint to change sides while the 50-foot foiling catamaran was turning while going about 27 knots on the fifth of seven legs. Two crewmen were the first to move from the starboard hull to the port hull. Then came Outteridge and another crewman. The boat began to straighten and there went the skipper, sliding off the back beam and into the sound. “I was just looking for something to grab onto,” said Outteridge, an Australian who has won Olympic gold and silver medals. “These boats are pretty aero, so there wasn’t really much there. I tried to grab some net or a bit of the boat and just must missed everything and ended up in the water. Outteridge said the crew will review video and determine what it would do differently if he goes overboard again. “The main goal is to stay on the boat from now on,” he said with a smile. Outteridge was plucked out of the water by a chase boat and was OK. He was fortunate that he wasn’t injured. In late 2015, skipper Franck Cammas of Groupama Team France fell overboard during a training session and one of the rudders nearly cut off his right foot. “It’s the first time it’s happened to myself or to probably many people in these boats and I don’t think it will be the last, either,” Outteridge said. The winner of this series moves on to face two-time defending champion Oracle Team USA in the 35th America’s Cup match starting next Saturday. Team New Zealand had just pulled ahead of Artemis when Outteridge had his splashdown. “Before Nath went off it was shaping up to be a really close top mark,” said Burling, himself an Olympic gold and silver medalist who went head-to-head with Outteridge in the London and Rio Games. Artemis had been nearly perfect in Race 2, leading wire-to-wire and staying on its hydrofoils the whole way. In the first race, Artemis had the lead but Outteridge crossed the course boundary for an unforced error and had to slow to two boat lengths behind the Kiwis. Burling sailed ahead to a 47-second victory. Outteridge’s tumble was the latest mayhem in the challenger series. On Tuesday, Emirates Team New Zealand capsized at the start of a semifinal race, throwing three crewmen into the water and causing significant damage. The next day’s racing was postponed by high winds, and the Kiwis returned to the water on Thursday to eliminate Britain’s Land Rover BAR and clinch a spot in the finals. Artemis led at the start of all three races Saturday. Burling didn’t think Artemis would be ahead 2-1 if Outteridge hadn’t gone into the drink, saying the team’s cycling grinders were still on top of their game.